RS Components (RS), the trading brand of Electrocomponents plc (LSE:ECM), a global multi-channel distributor, has announced availability of the Fluke Professional series of infrared thermal imaging cameras, which provides crisp and highly detailed images that help maintenance engineers and technicians to locate hot spots and diagnose potential problems in electrical systems. The series includes four models: the Ti300 PRO, Ti400 PRO, Ti450 PRO and the top-of-the-range model, the Ti480 PRO. 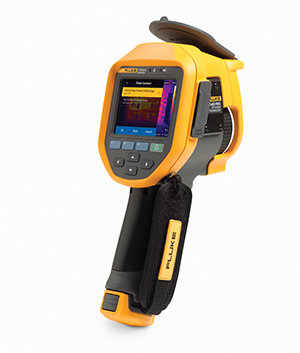 Able to measure temperatures up to 1200°C, each camera comes with a wide range of viewing features and a high-resolution LCD touchscreen, as well as Fluke Connect®, a comprehensive software platform that enables easy equipment monitoring. Saving time and improving the reliability of maintenance data by wirelessly syncing measurements, Fluke Connect allows technicians to optimise images, perform analytics and generate customisable reports, all of which can be exported to the Fluke Connect cloud-storage facility. All four models in the PRO series feature excellent image quality and the manufacturer’s LaserSharp® autofocus feature as standard, while the Ti400 and Ti480 also integrate Fluke’s MultiSharp focus capability. Specific viewing capabilities include: spatial resolution ranging from 1.75mRad up to 0.93mRad; display resolution from 240 x 180 up to a ‘SuperResolution’ mode of 1280 x 960 for the Ti480; and a 24° horizontal by 17° vertical field-of-view for three models, rising to 34° x 24° for the Ti480.